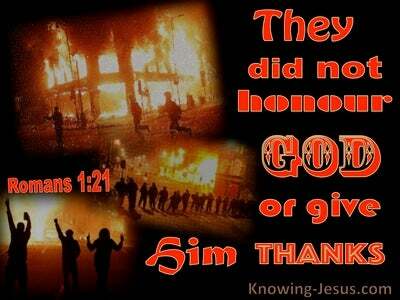 What Does John 12:48 Mean? 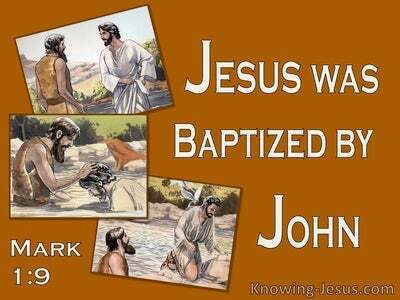 Jesus was the incarnate Word of God. He was the fulfilment of God's written Word - for this Man was the Word made flesh, about Whom the Scriptures spoke, and towards Whom the prophets pointed. Jesus Himself said, it is the Scriptures that testify about Me, and I have the words of eternal life. As the living Word of God, Jesus was the embodiment of the eternal God, through Whom all things were made. Moses foretold His coming, and commanded the people of Israel to hear Him, and to listen to Him.. because He would speak to Israel on behalf of God, and He would converse with the Almighty, as man's representative. Jesus was the prophet about Whom Moses prophesied, and he was the Daysman, for Whom Job yearned. Job longed for someone who would be able to lay His hand upon both man and God - someone who was able to speak in the name and power of the Lord God almighty, as well as being the representative man - who could intercede on behalf of humanity. Jesus was the Logos; the Word made flesh; the Lamb of God and man's sinless, kinsman-Redeemer. Jesus was the Daysman, for whom Job longed, and to reject the Lord Jesus, is to reject the very Word of the Father - for He is the image of the invisible God, through Whom the Father was speaking. Jesus was appointed as heir of all things, and it was through Him that the world was created. He is the radiance of God's glory and the exact representation of His holy nature. By the word of His power He upholds all things - and at the appointed time He came to earth, as the Word of God made flesh .. to save His people from their sins and to set up the promised kingdom of God. BUT they refused to recognise Him as their Messiah-King, and through pride and ignorance, they rejected the Lord of glory. 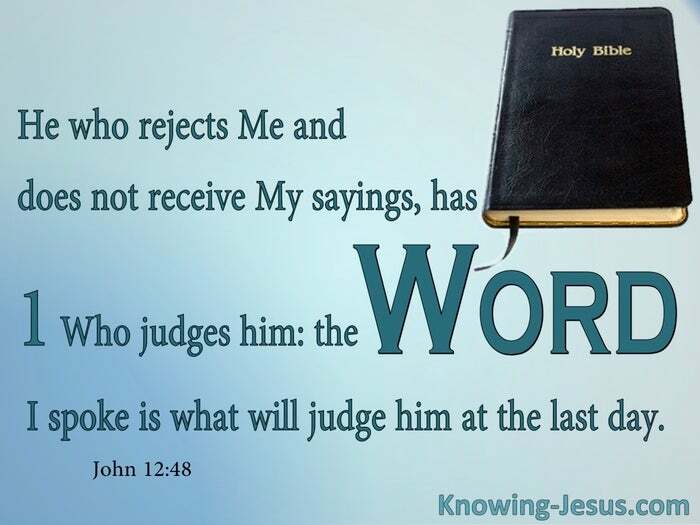 It would be with both sadness and righteous anger that Christ had to warn the proud, unbelieving Pharisees, with His blistering words: the one who rejects Me, and does not receive My sayings, has One who judges him. 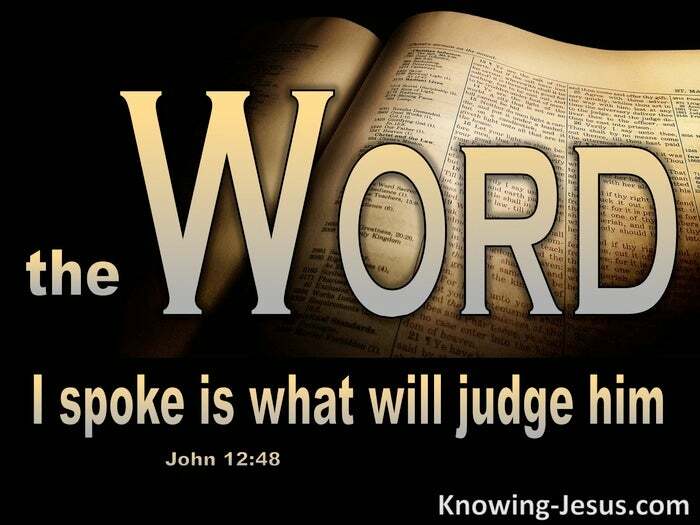 The Word I have spoken is what will judge him at the last day - for the Word that Jesus spoke, were the very words of almighty God. The unbelief of these high-minded, religious Pharisees, brought the full force of God's condemnation crashing down on their heads - for He who believes is not condemned, BUT the one who does not believe is condemned already, because he has not believed on the only begotten Son of the living God. These foolish men were blinded to the truth of God, and deaf to His Word, for the Lord Jesus was almighty God, manifest in human flesh. The incarnate was standing in their very midst, and they did not know Him. The Lord Jesus came to seek and to save that which was lost, in fulfillment of holy Scripture. He did not come to judge the world, but that the world through Him might be saved. However, when the Lord Jesus returns, to set up the kingdom of God on earth.. He will return as judge. 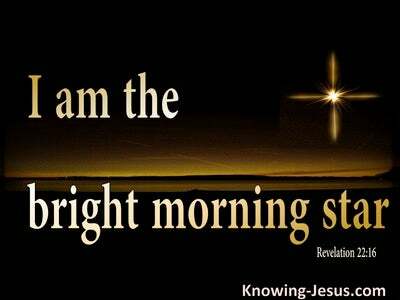 He is the Man, Whom God has annointed to judge the world with justice, for God has set a day when the Man, Christ Jesus, will judge the world righteously. The world will one day be judged by a Man, Whom God has appointed for that task. Indeed, God gave credible evidence that Jesus is the appointed Man - by raising Him from the dead, as is written in holy Scripture.